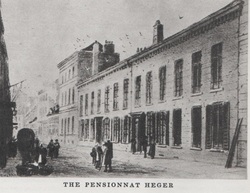 When Charlotte was 25 years old, she and Emily Brontë were students at the Pensionnat Heger in Brussels, they received instruction in French Literature from Monsieur Heger. He taught them first to read and analyze the phrasing and structure of French passages and then to choose their own subject matter and write out their stories in a style that borrowed heavily from the original text. Approximately thirty of these homework essays (or devoirs) have survived. 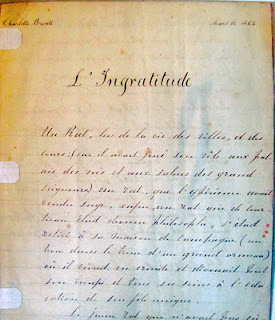 Recently, one of Charlotte’s stories, dated March 16, 1842 and entitled L’Ingratitude, has been found in the Musée Royal de Mariemont in Belgium. M. Heger’s son had given the story to a Belgian collector in 1913.